Size: 13.7 x 19.4 inches. 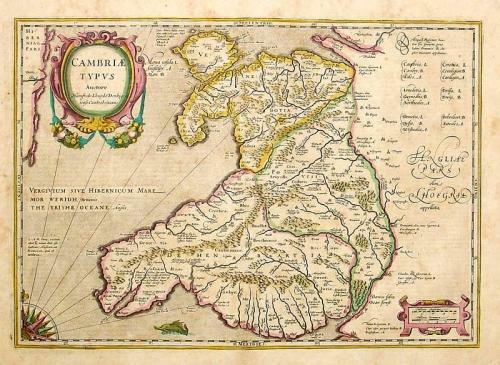 An ancient map of Wales, originally prepared by the Welsh cartographer Humphrey Lhuyd and reproduced for famous the Mercator Jansson atlas of 1642. The map is decorated with a fine cartouche, part of a compass-rose and a sea monster. The condition of this map is very good and the paper is of good quality although slightly age toned as is common with this series of maps. There is some slight water staining in the margins although this does not distract from the image.